In this class, you will learn the basics of macramé knotting and then choose from a fascinating variety of bead placements to create a unique bracelet of your own! 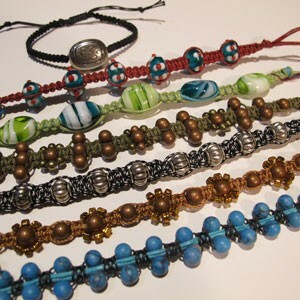 We will cover a variety of usual and very unusual ways to combine beads with cord. You will come away with a finished bracelet, along with detailed, printed instructions for applying these techniques in future projects. All tools needed will be available to use in class, and for purchase.